Six healthcare IT giants announced this week the launch of a nonprofit organization to promote interoperability and universal access to healthcare data. At Monday’s press conference at the Healthcare Information and Management Systems Society (HIMSS13) conference, executives from Cerner, Allscripts, Greenway EMR, athenahealth (a Revenue Cycle Management company), McKesson, and McKesson subsidiary RelayHealth pledged to collaborate in the effort to create and define common platforms and policies for a certified national infrastructure, in order to achieve data liquidity between systems. The CommonWell Health Alliance aims to improve the quality of care delivery while also lowering the overall cost of healthcare for patients, providers, and the entire industry. 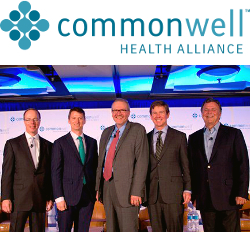 Hammergren noted that there was an open invitation to all healthcare IT companies to sign on, calling the effort an “industry-led approach… one we hope everyone will join with us on.” The founding members of the CommonWell Health Alliance invite all HIT suppliers to join them in working together to provide seamless, trusted access to health information, in support of better, more cost-effective care for their patients and communities. Update: PrimeSuite by Greenway announeced a free connection to the commonWell for PrimeSuite clients to find out more click on this link.